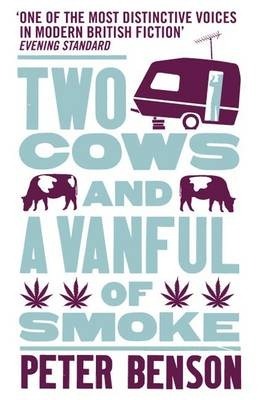 Two Cows and a Vanful of Smoke is a charming, funny coming of age story and full of West Country allure with bent cops, a superstitious Mother, hippies in hospital and a vanful of weed. I galloped through this book and I really enjoyed the sharp, direct writing. Set in Ashbrittle, Somerset, during the longest, hottest summer of 1976, Two Cows and a Vanful of Smoke is told through the first person narrative of twenty-something Elliot, a loveable yet misguided character. He gets a labouring job after being sacked from his previous job for liberating six sows, as they seemed to be telling him that they wanted to be free. He thinks working for Mr Evans will offer him peace and quiet so he can stare out across the fields. He even takes the big step of moving out of his parents’ home to live in a grotty caravan in the farmyard. I have read a lot of books with urban settings and so I found Two Cows and a Vanful of Smoke very refreshing. This book entices the reader into the virtues of the countryside and celebrates the natural world. From the beautiful descriptions, it is obvious that Benson loves the West Country. The countryside becomes another character in the book. Setting a thriller in the countryside could have easily fallen into a clichéd cat and mouse plot but Benson carefully weaves in romance, family struggles and finding a place in the world. This book isn’t about the middle class woes of countryside folk. These characters are trying to make a living and struggling against the heat of the summer. I’m rather partial to ordinary characters who are pushed into extraordinary events. Benson avoids stumbling into Midsomer Murders territory by keeping the language direct and simple, and mixes local folklore with Elliot’s mother's clairvoyance to keep the plot fresh. Two Cows and a Vanful of Smoke taps into the popular trend of ‘slackers,’ which we are seeing in films at the moment. This book would make a great black comedy film with the usual suspects of British actors or even make a great Sunday teatime six-parter for the Beeb. "I’m rather partial to ordinary characters who are pushed into extraordinary events." Well put! So am I!